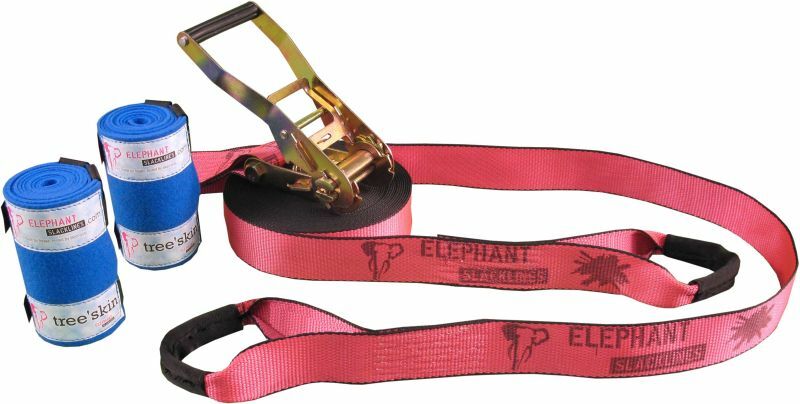 The Elephant Slackline rookie flash'line is a starter slackline by Elephant. All slacklines by Elephant are produced in Germany and are certified Made in Germany. Elephant stands for loud colours and the pink Elephant Slackline rookie flash'line is not only an eyecatcher but also makes slacklining longer in the evening possible. The sporty 15m-cow hitch-system rookie, including a slackline and a high-quality 50mm standard ratchet, can be assembled easily and quickly. Round edges, black borders, and a width of line help to achieve quickly success. The Elephant Slackline rookie flash'line is equipped with the approved flash'line. In a set with the tree'skin tree protection, the Elephant Slackline rookie flash'line allows an affordable start into slacklining with a high-quality product! Goed en degelijk product. Montage heel makkelijk. Geleverd zonder boombeschermers (dus niet zoals afgebeeld) maar dit was bekend. Uiteindelijk na een aantal uurtjes oefenen is blijven staan op de slackline ook weer onder de knie. Veel bekijks als je in het park aan het balanceren bent.